Wilfredo Vazquez Jr. (18-0-1, 15 KO's) captured the WBO super bantamweight title by defeating Marvin Sonsona (14-1-1, 12 KO's) via fourth round knockout. The 25-year-old Vazquez improved in each round, landing sharp, accurate left hooks and right hands. Sonsona, 19, who moved up two weight classes, could not stop Vazquez from imposing his will on him. "I knew he had a good punch, but I had experience. This is my night, and now I'm anxious to scale the heights of this division," said Vazquez. Sonsona was much more fluid with his punches than Vazquez in a slow paced round one. Vazquez seemed hesitant to let his hands go. Maybe Vazquez was just being patient? In round two, Vazquez used his feints to create openings and started to push Sonsona back with hard right hands and left hooks. Vazquez continued to press the action in round three, where he trapped Sonsona against the ropes. Vazquez landed a left hook to the body, but Sonsona, a southpaw, countered with a quick left uppercut. Then, Vazquez fired a right to Sonsona's head. Vazquez displayed a lot of patience before placing his punches, but sensed he could take the younger Sonsona out. In round four with Sonsona's back against the ropes again, Vazquez landed a left hook to the body and followed it with a straight right that snapped Sonsona's head back. Next, Vazquez unleashed a left hook to the body that floored Sonsona, who went down after a delayed reaction to the punch. Sonsona could not beat the referee's ten count. 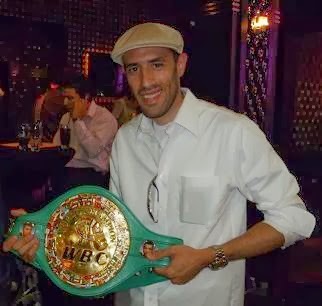 Vazquez is unbeaten, but more importantly, he established himself as one of the sport's most elite fighters. On the other hand, Sonsona discovered that jumping two weight classes at the very young age of nineteen proved costly. Then again, Sonsona faced a great reward with a victory. In his professional debut, McJoe Arroyo stopped Giovanni Rivera in the second round of a bantamweight bout. Arroyo, a southpaw, floored Rivera in the first round with a flush, straight left to the face. Then, Arroyo landed a questionable low blow, which resulted in Rivera receiving extra time to recover from the referee. However, Arroyo closed the show in round two when he landed a solid left to Rivera's head. The devastating punch sent Rivera back into the ropes before he hit the canvas face first. In a cruiserweight bout, 6' 6" Carlos Negron scored a first round knockout over an overmatched Roy Ashworth. After flooring Ashworth earlier in the round, Negron connected with a sharp left hook to the head that put Ashworth down for the ten count. It was Negron's fifth 1st round knockout as he improved his record to 8-0, 6 KO's. McWilliams Arroyo, twin brother of McJoe Arroyo, scored a destructive, first round knockout over Eliecer Sanchez. Arroyo connected with a hard right hand that stunned Sanchez. Then, Arroyo landed a right uppercut in close range. As Sanchez pulled back, Arroyo let go a crushing, straight right, which landed perfectly on Sanchez's chin. For approximately two minutes, Sanchez lay motionless on the canvas. However, Sanchez was helped to his stool and appeared okay. Both men were making their professional debut in the flyweight division. wow I love your sports blog..